First, I just want to say that I am so flattered and excited about the huge response Wplus9 has been receiving over the last few releases! I can't express how much the comments and encouragement mean to me. I truly appreciate each one. And though I may not reply to every comment, I do read them all and go through and randomly reply to a lot of them. Thank you guys so much! So, are you ready for the full reveal? Introducing the newest addition to the Wplus9 Design Studio. Ever After will be available for purchase on Wednesday, September 1st at www.wplus9.com. Still itching to see more samples? The design team has more to share with you today. Be sure to check here to see if you are one of the lucky winners of Ever After, I will post the 2 lucky winners by noon today! It's day 3 of our September Release Sneak Peeks. And today, I've returned to my CAS roots to shine the spotlight on the large bloom and leaf outline images included in Ever After. I chose a simple layout and color combo to really let the gardenia shine. I just love how this image colors. It's not overly complicated, but has just enough detail to really have fun while you are coloring it. Depending on how you highlight and shade it, the amount of movement in the petals is really in your control. 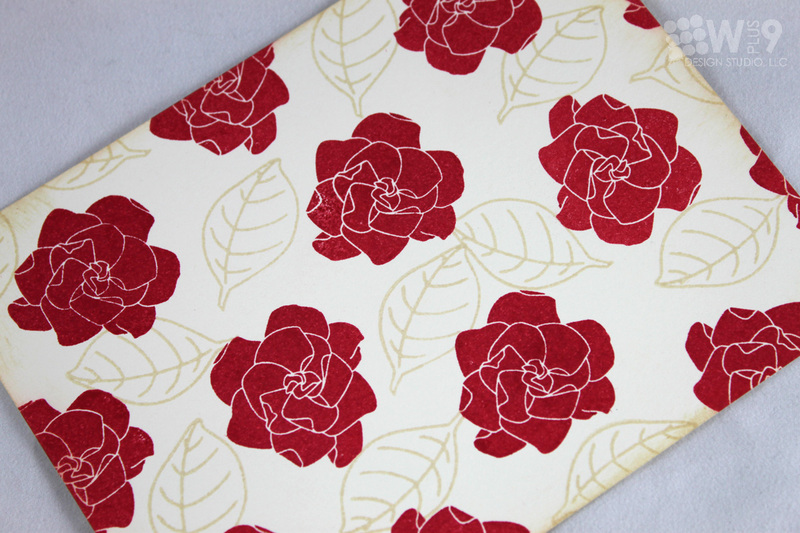 Gardenia petals are pretty large and smooth, which makes it a breeze to fussy cut. 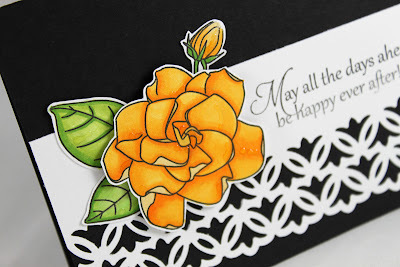 I stamped the leaves, bloom, and bud on white cardstock, colored them with Copics and fussy cut them all out. The girls have more for you today as well, head on over to see what they done. They have totally blown me away this release! And don't forget, today is the last day to leave a comment for a chance to win "Ever After". Leave a comment by 11:59 pm August 30th, and I will pick two random winners from all countdown comments combined to win "Ever After". Be sure to leave a comment each day to increase your chances! I'll be back tomorrow with the full reveal. Welcome back to Day 2 of our sneak peeks. I want to thank you all so much for all of the kind, kind comments you've left and for all of your support. Seriously, from the bottom of my heart, thank you. 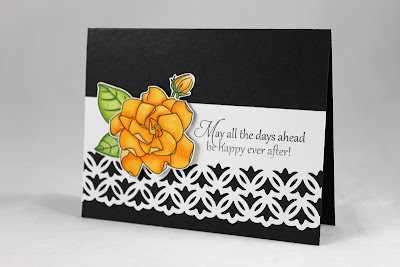 I have some more samples for you today, using our September Release stamp set, Ever After. 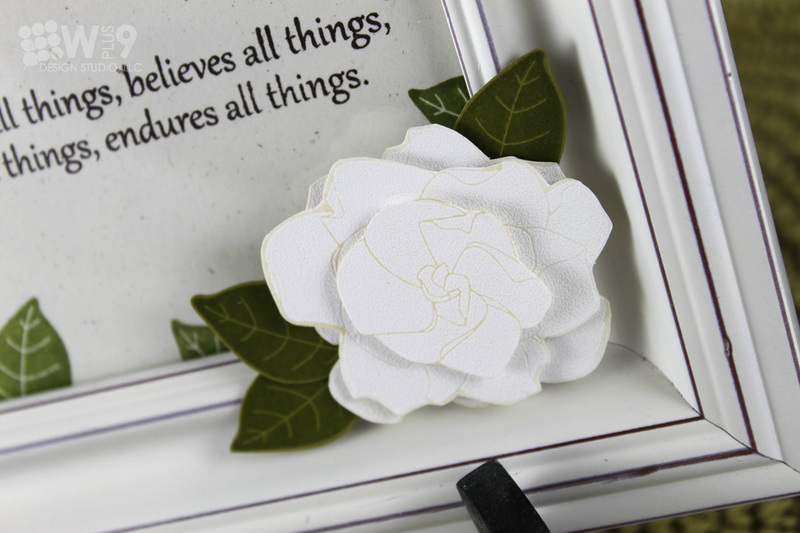 This set focuses all around one of the most fragrant flowers, the Gardenia. Yep. That gorgeous white bloom with the deep green, wide, waxy leaves and the intoxicating scent. I just love this flower and it always makes me think of weddings. Such a truly elegant and classy flower. I tried to throw you off yesterday by coloring the stemmed gardenia included in the set in pink. OK, so I mostly did it just to show you how this really can be colored to be made like any flower you want. 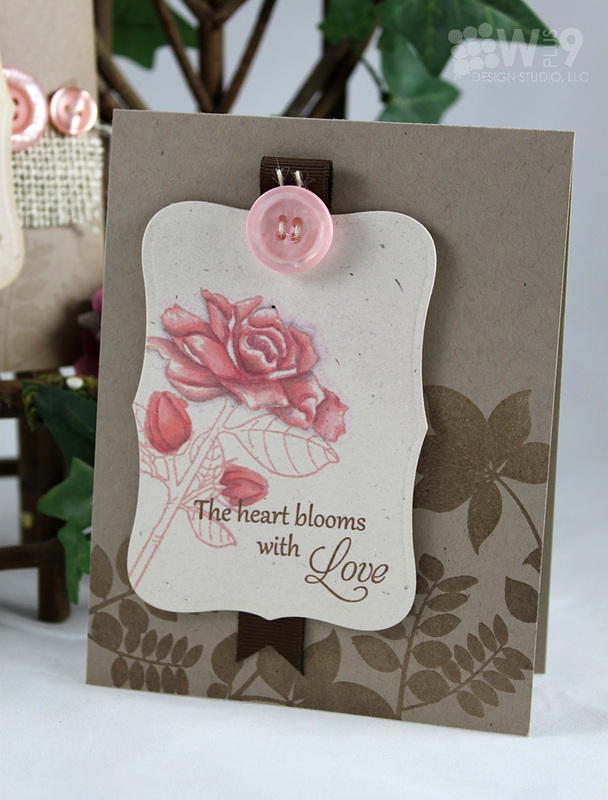 But today, I want to show you how this set truly captures the essence of that beautiful flower. I started by stamping the large solid bloom three times in Versamark onto white cardstock and embossed them using White Detail embossing powder. After embossing them, I wanted to add just a bit of creamy depth, so I went over all of them with some Tim Holtz Distress Ink in Antiqued Linen. This added just the right amount of shadow and dirt. To assemble, I cut two of the blossoms out whole, trimmed off the outer petals from the third, and then stacked them with dimensionals. 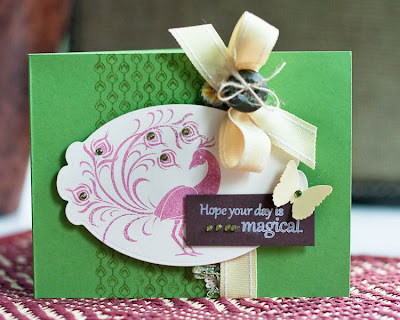 I stamped the solid leaf in Old Olive ink (Stampin' Up!) onto Ripe Avocado cardstock (Paptertrey Ink) and trimmed those out as well. I used some glue dots to adhere the bloom to the outside of a frame I picked up from Micheal's. 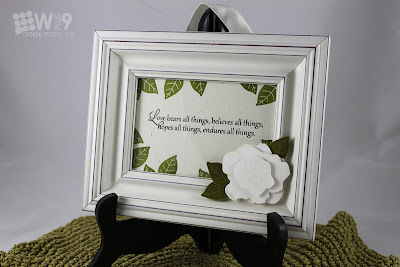 For the inside, I used a Vintage Cream piece of cardstock, and stamped another of the sentiments that is included in Ever After in Dark Brown Colorbox ink. And all around the edges randomly stamped the same leaf. Truly not much else was needed. These images really do stand on their own and little effort is needed to create a stunner. For this, I used one of the outlined leaf images and the small solid bloom and randomly stamped them onto Very Vanilla cardstock (Stampin' Up!). I inked the edges a bit and then sprayed the whole thing with some Glimmer Mist. Since the pattern is a bit loud and busy, I layered it under a Kraft panel that I stamped with the solid leaf in Vintage Cream (Papertrey Ink) and added both the large and solid blooms stamped in Riding Hood Red ink (Stampin' Up!). I finished it off with another of the sentiments included in Ever After. 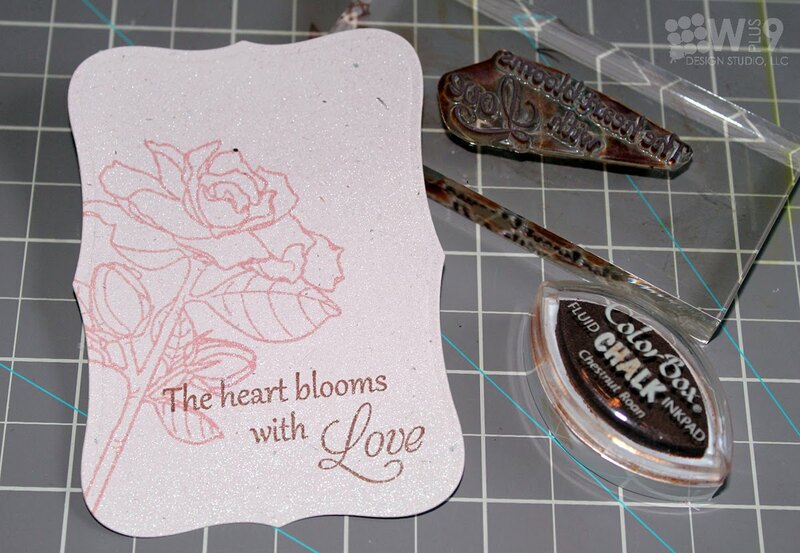 I really like this color combo, the Tim Holtz distress ink in Antique Linen comes out looking a bit gold when used to stamp with. And don't forget since this is the only set releasing this month, the giveaway is a bit different. Leave a comment by 11:59 pm August 30th, and I will pick two random winners from all countdown comments combined to win "Ever After". Be sure to leave a comment each day to increase your chances! Welcome to the Wplus9 Design Studio September Release! As usual, we will spend the next couple of days giving you peeks at some projects created using stamps from this month's release. This month, we are only releasing one stamp set. But don't fret, it is simply gorgeous. Am I allowed to say that? Oh well, it is! 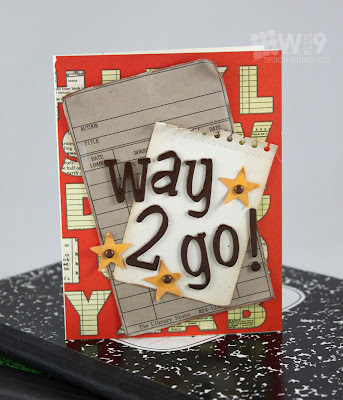 I am am so happy to be able to devote all of the countdown days to this stamp set...it is that much fun. 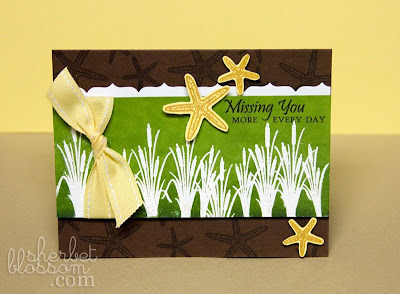 Today I am focusing on one of the images and sentiments included in the set. As you can see, I've taken basically the same card, and by switching just a few of the materials created one very soft card and the other just a bit more modern and graphic. 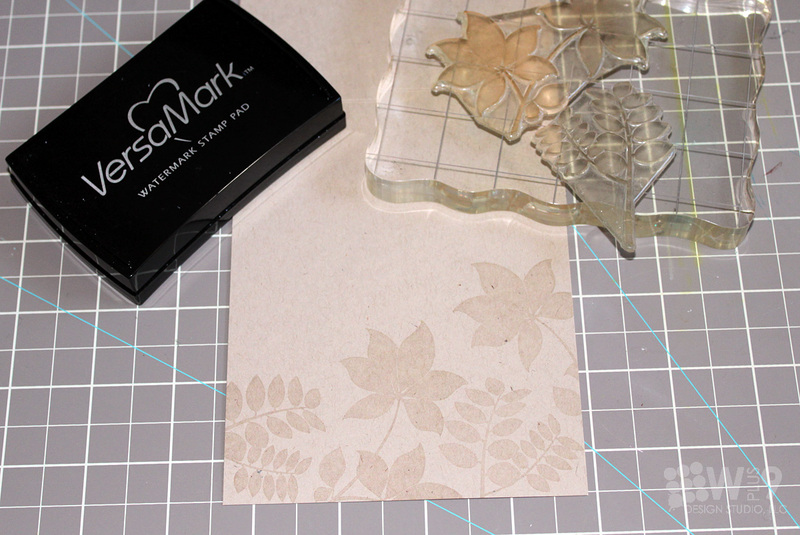 I started by stamping some of the leaves from Woodgrain Silhouettes Additions in Versamark onto a Kraft card base. 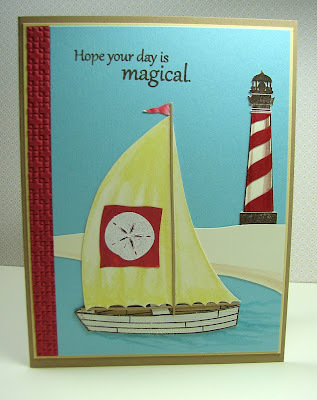 For my focal image, I cut a label from Vintage Cream cardstock using a Spellbinder's die. I spritzed the entire label label lightly with Glimmer Mist and let it dry completely. Once dry, I stamped the flower and stem in Tim Holtz Distress Ink and added my sentiment. I am IN LOVE with this font. You will see a lot more of it in the future. This really does glimmer so softly and beautifully in person, click on the picture to zoom in and I managed to catch some of it on film for you guys. For my coloring, I used my Copics, and decided only to color the blooms. This was a personal preference and you could certainly color it all if you'd like. But I just left the rest bare for interest. Here's a quick tip as well. You'll notice that closest to the center of the flower, where the petals have been drawn to curl in, I have left these little "lips" the lightest color instead of coloring them darker. 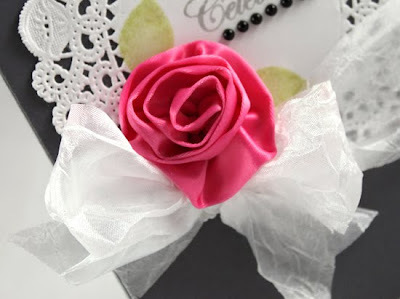 This causes the petals to appear to fold over instead of curling in. Then towards the bottom I've colored them darker. Just another way to use your colors to manipulate the image the way you want it to appear. I finished of the base of the card by adding a little burlap and some DeNami buttons. I actually pulled one of the fibers from the burlap to thread through the buttons, I like the way this ties the two elements together even further. All that was left was to assemble the card. For the second card, I just made a few small changes. 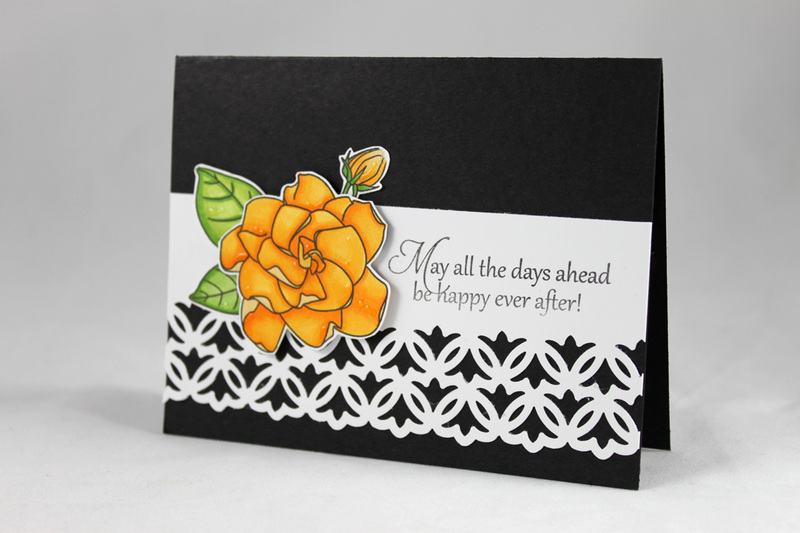 I embossed the background, and added more depth and shading to the coloring of my flowers to give the card more contrast. 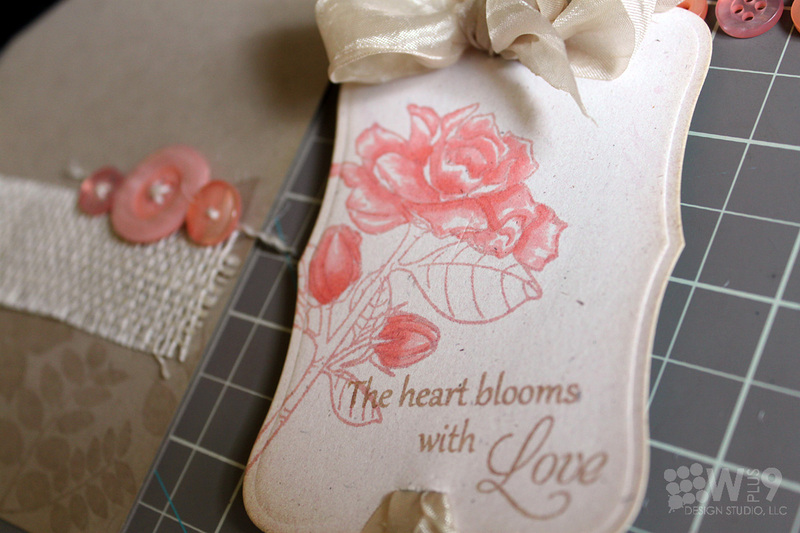 I used a deeper chocolate color for my sentiment. And finally, I omitted the burlap and buttons, and switched the crepe ribbon for some chocolate grossgrain. Want to see more? All of the girls are joining us today so be sure to stop by and show them some love. You'll notice that I haven't actually said what kind of flower this is...huh? So what kind of flower do you think it is? Here's a hint, I have not depicted it in it's native color today. Since this is the only set this month, I'll be doing the giveaway a bit differently. Leave me a comment by 11:59 pm August 30th. I will pick two random winners from all countdown comments combined to win "Ever After". I'll be back tomorrow with more from this fabulous set! 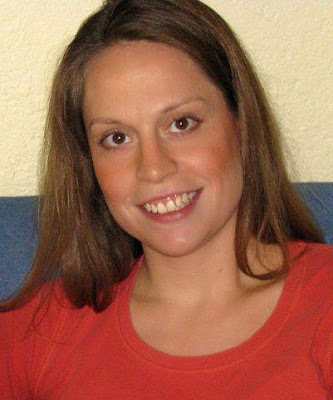 The summer is coming to an end, and with it we are sad to see Heather Pulvirenti finish her rotation here with us. But we will not say goodbye, instead we say "Thank You" and let her know that she is welcome back ANYTIME! 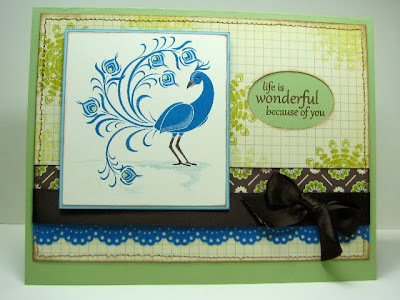 I have truly enjoyed seeing her fabulous designs, bold color combos, and the unmistakable "Heather style" using Wplus9 stamps. Thanks again Heather! But...we now get to welcome the fall design Design Team members. First, Hannah Craner will be staying with us for another rotation. How excited are we?! Yah!! Second, it is my pleasure to welcome a fellow crafter who I have had my eye on for quite some time (not in a creepy way!). 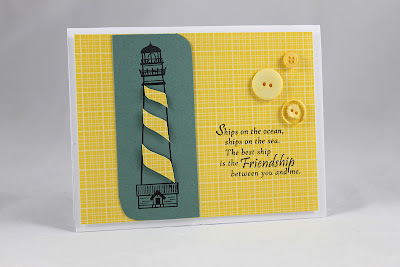 She is a fantastic card maker with a wide range in her designs and always includes just the right amount of detail. And, let me just say, I absolutely envy her scrapbook layouts. "I am a former, kindergarten teacher turned stay-at-home, home school mom to a smart, spunky, seven-year-old Ezekiel and a vocal, tenacious, one-year-old Adina. My husband, BJ, and I feel, overwhelmingly, blessed to call them ours. 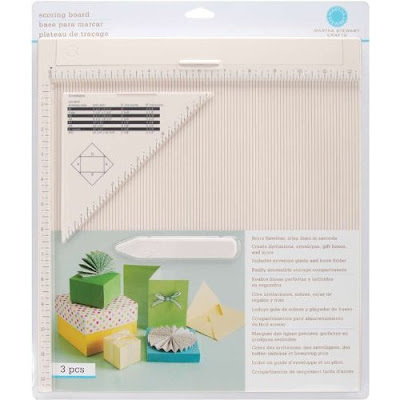 When I'm not taking care of or playing with my family, you can find me cooking, baking, gardening, camping, sewing, teaching Sunday school, and of course, papercrafting. 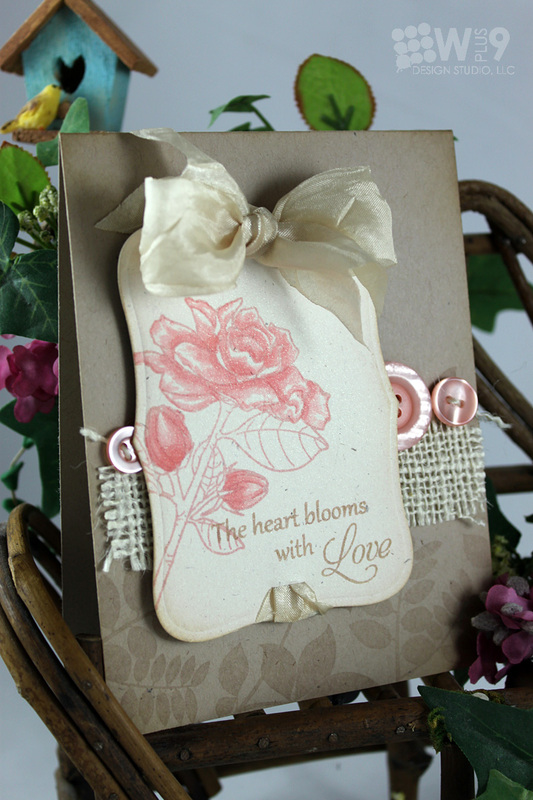 My love for stamping started over nine years ago, now, at a Stampin' Up workshop, but my love for creating began before birth. I'm so excited and, truly, honored to be joining the Wplus9 Design Team, over the next few months, and hope that I can inspire you to get crafting." Please join me in welcoming her to the Wplus9 Design Team. 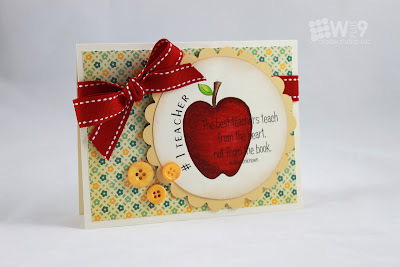 And be sure to stop by her blog to check out her amazing work! Man where does time go?! I've been meaning to post this for almost a week. If you are looking for a challenge, and an opportunity to win some Wplus9 goodies, hop on over to Aspiring to Creativity for their 2nd Glimmer Challenge. I also wanted to send a great big HAPPY BIRTHDAY out to Ms. Kerrianne Gwin! I had a blast this weekend girl! 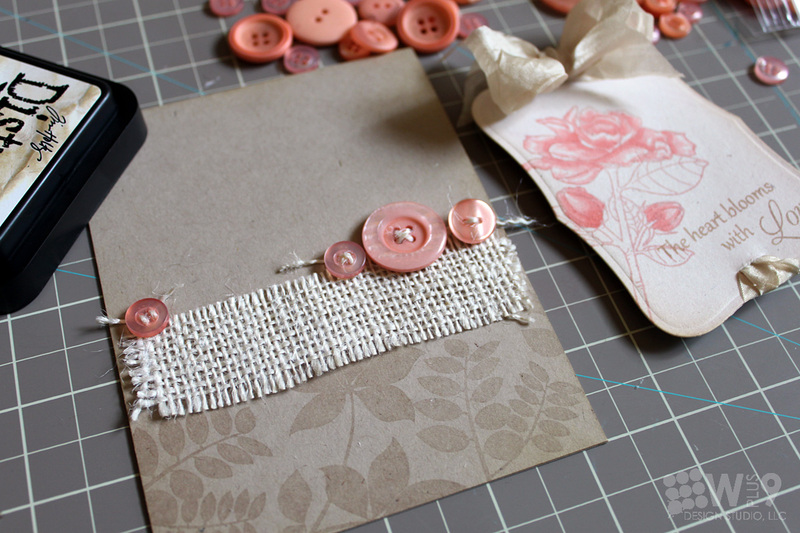 I'm off to do some illustrating, be back soon with a card, I've got a few stacking up and itching to be shared. 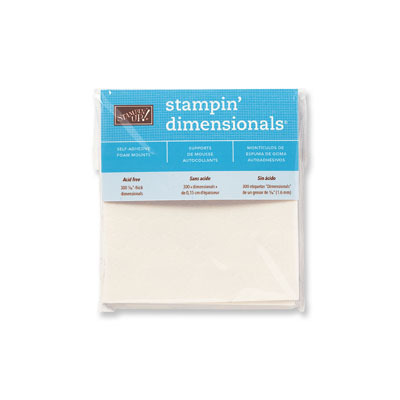 This month we are focusing on our "Must Have" supplies. You know, those things that we turn to again and again to create our signature styles? I've asked each of the girls to list out what they can't live without and their manufacturers if they have a preference. I myself, am quite a schizo when it comes to my style, but if I had to pick one, I guess it would be clean and graphic. Even when I try to do something in a different genre, there is always an underlying clean and graphic feel to it. So in no particular order, here are my "must haves". Like most crafters, I have 2 pair that I can't live without. 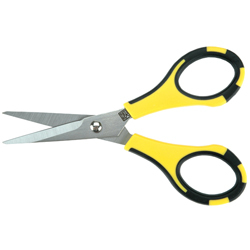 My paper scissors and ribbon scissors. 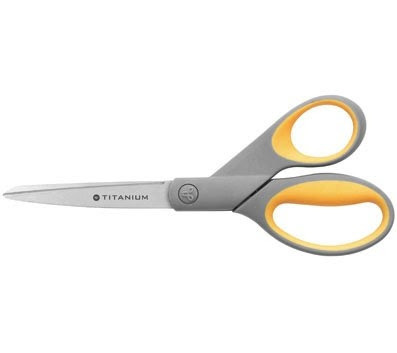 Westcott Titanium for ribbon and fibers. Cutter Bee for detail cutting. Oh, who doesn't go through gobs of this stuff??? I prefer only one brand, if you know of a better one, I'm all ears. Nothing beats a crisp fold, and did you know score lines are great for adding texture to a card too? For way to long, I archaically used the back of a butter knife and the groove in my paper trimmer to score. tsk tsk, I know! Until I found this baby that is. Martha Stewart Scoreboard by EK Success. I LOVE this thing. It even comes with an envelope template. Scoring boxes has never been so easy, why oh why did I wait?! I can't say enough good things about twine! Seriously love this stuff. Rustic Jute Twine by Papertrey Ink. Woodgrain Bundle by Wplus9 Design Studio. I seriously use these stamps way too much, but I can't help it. 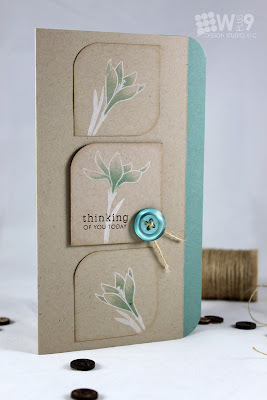 And just to tie it all together, here is a card that uses a lot of My Must Haves. 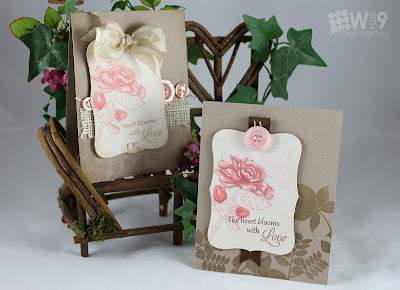 Be sure to stop by the rest of the Design Team's blogs to see what they "must have"! Thanks for stopping by and I hope you have a fantastic Friday!! As promised, I am back to share another Cutting Cafe goody with you. 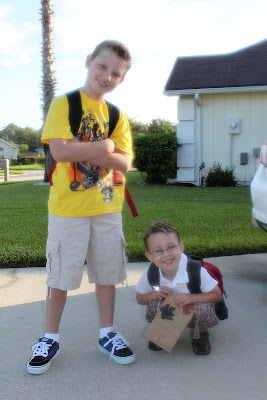 My boy's started school this past Monday, 4th grade and Kindergarten. So I thought the All About School printable stamp set was quite appropriate for the occasion. This set includes 38 images for just $6.99! Here, I layered two of the images together before printing. 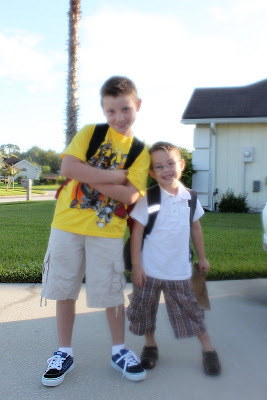 I also wanted to share a few pics of the boys on their way off to the first day of school. Bummer...it is SOOO humid here that as soon as I took the camera outside, the lens started to fog up. I was able to snap just a few before it was completely useless. LOL Oh well, it will just add to the memory, right!? On a side note, I wanted to apologize for not stopping around and giving much blog love lately. As some of you may remember, I have a huge deadline at work coming up in Sept. So my time has been EXTREMELY limited, and I've only been able to fit in the top priority "must do"s. Not that you guys aren't high on that list...but I'm sure you would much rather have me tracking down manufacturers for some new products. *Hint *Hint Right?! Thanks for all of the love! Oh and Mehndi Medallions will be back in stock shortly. I will let you guys know as soon as they hit my doorstep! 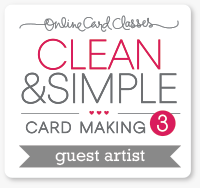 Guess who's Guest Crafting over at the CARDS Magazine Create Blog? Me! 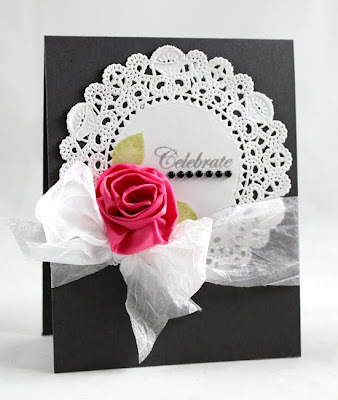 Head on over there to get all of the details on this card, plus a detailed tutorial on how to create these ribbon rosettes yourself. It's much easier than you'd think! Don't forget to leave some love while you are there! 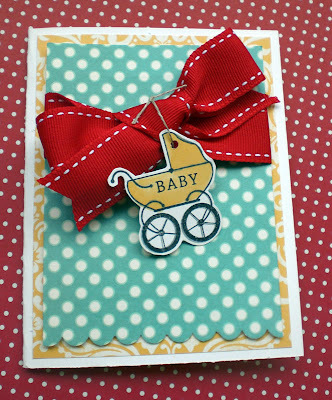 Create a card, scrapbook page, digital layout, tag, whatever...just make sure to use the above colors, aqua, gold, red, cream (or white). Anything you have on hand close to the colors will do. Black or Brown for sentiments or outlines is fine as always. You have until September 7th at 10:59 pm EST to play along. You will know the deadline has passed when the link to add your project is no longer available. I have been trying to step outside of my usual box more lately and have recently accumulated a bit of patterned papers. 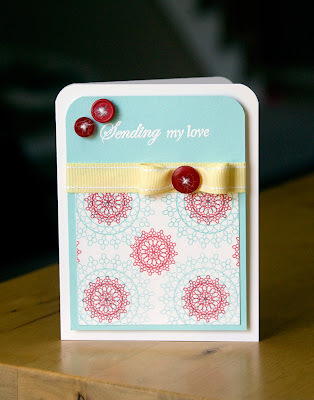 For this card, I paired Lovey Dovey by We R Memory Keepers paper with a sentiment from Wplus9's Love Birds. 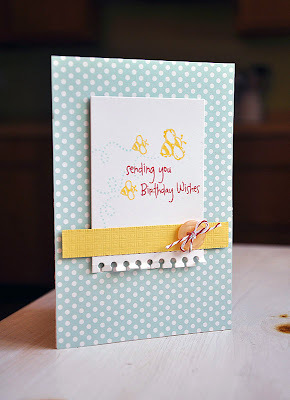 Patterned paper makes a quick and simple card come together in a snap. Karen is our On Cue feature as well as Elise's personal pick. How is that for a round-up?! There were so many gorgeous creations for this color combo. It seems this one really pulled at the girly side of us. I saw so many flowers and butterflies and flourishes...just beautiful. 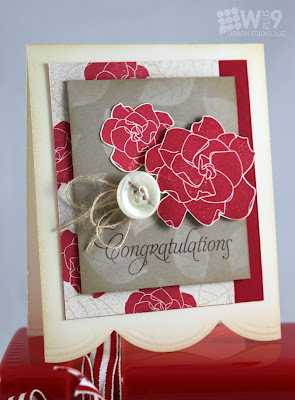 Congratulations Karen, you and your card will be featured on the homepage at the Studio, www.wplus9.com! Thanks again to everyone who played along, the next Color Cue will be up on the 15th, I hope you find some time to play again! In the mean-time, how are you guys liking the Color Cue? The amount of time to participate? The color choices? Let me know your thoughts or suggestions. I just want to make sure you are having a good time! I have another Cutting Cafe goody to share with you today. The Library Card printable stamp set and cutting file. This little guy is so fun. 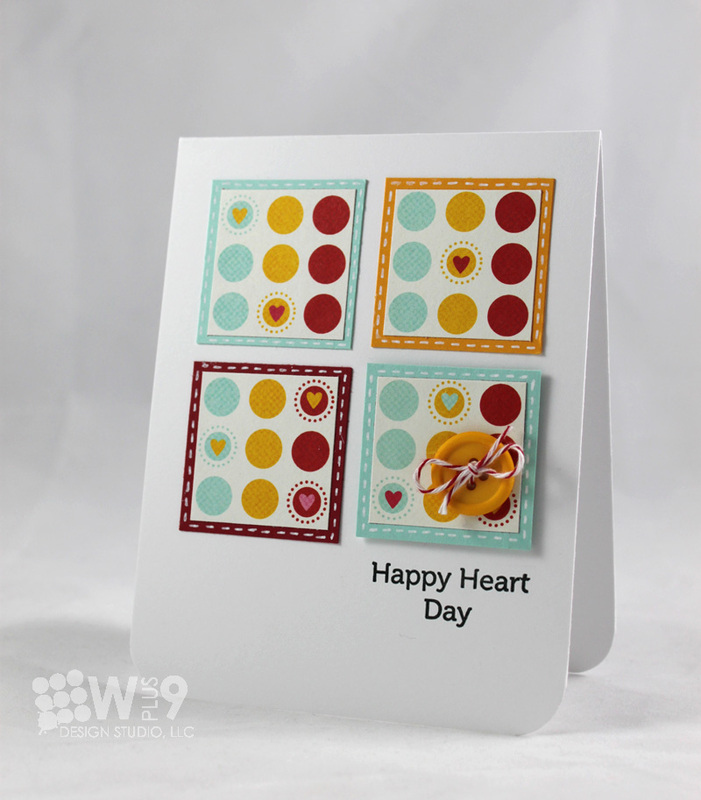 This set includes 6 different colors in 2 sizes and card holders for just $1.99! 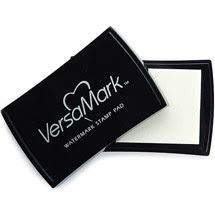 Just click and print and you've got as many of these as you need on hand just ready to go. Have a wonderful day and don't forget, the "On Cue" picks will be up very soon! Today is the day! The entire August Release is now available at www.wplus9.com. Today is Group Post day and we will each be sharing one more project using this month's stamps. Click on their names or pics to visit everyone's blog for full details and supplies, and don't forget to leave a comment while you're there. Everyone loves a comment! I decided to share a simple one today. Do you have Practicing Creativity's "You're Dandy"? 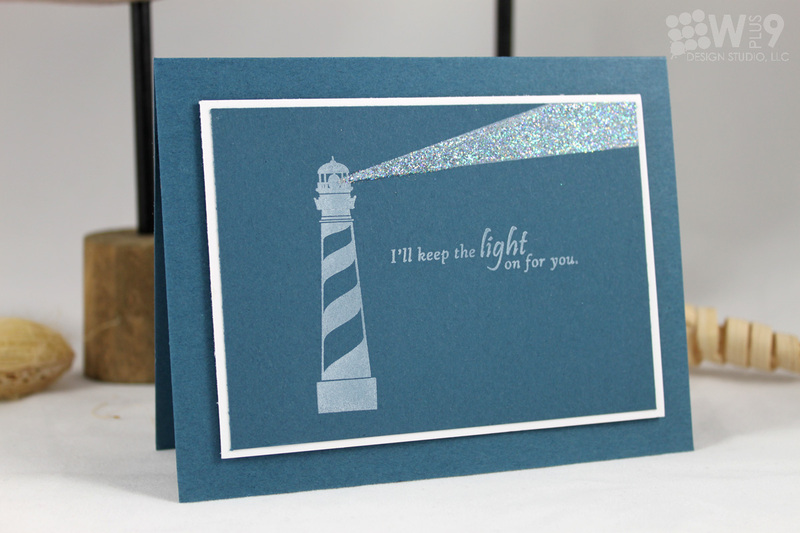 If you do, the sun rays included in Courtney's set are a perfect companion for Guiding Light! Here I used it to create the light streaming from the lighthouse in Guiding Light. Wouldn't this be perfect to slip into your honey's suitcase when he travels? Elise always captures my creative heart with her ability to create masterpieces out of something as basic as a silhouette stamp. Today is no exception. Just look at all of the detail in that peacock from Magical Moments. Just look at that color combo! I am in love with Hannah's earthy tones and this perfect palette for the transition from summer into fall using Guiding Light. How fun is this! Again, it's the use of color that catches my eye here. Heathers has paired a high contrast girly color combo with Guiding Light creating a completely different mood for this set. I love it! 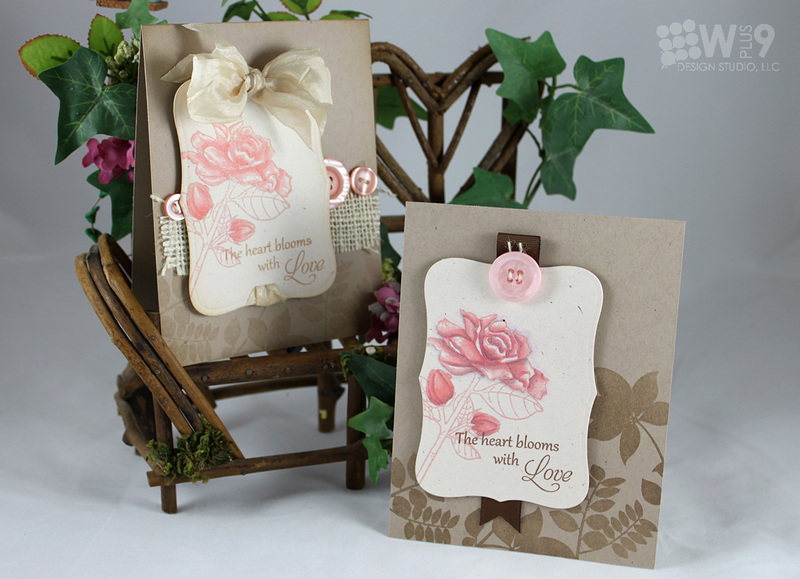 Maile works her soft girly side on this stunner using Magical Momentsand Design Basics: Backgrounds II. 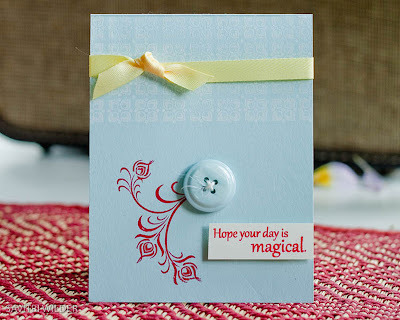 I love the shade she has used for the background stamping, allowing the flourish to pop. And I'm always inspired by her creative button placement. She is the master of "out of the box" layouts. 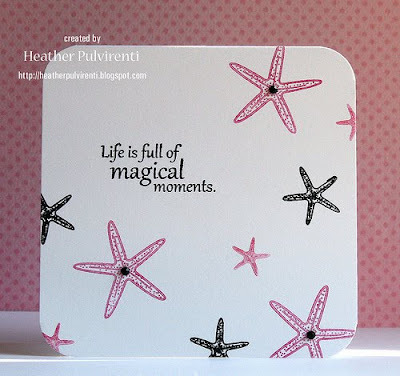 Savitri really works Magical Momentsand Design Basics: Backgrounds II here. 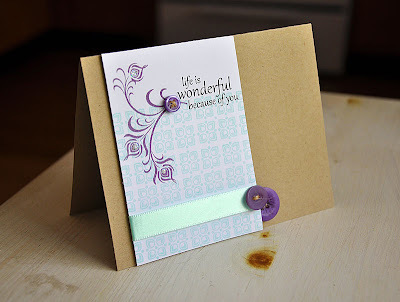 I really like the contradiction of color and soft layers she used on this card. I'm always amazed at how she can use layers, and lace even and still keep the overall feel of a card clean and simple. Congratulations to all of the winners this release! I also wanted to say Thanks! to my design team for all of your hard work and pulling together such amazing cards to share. I loved having the girls join me for the countdown. How about you?